Rep. Ted Lieu (D., Calif.) apologized Friday after mocking President Donald Trump's trip to Alabama to survey tornado damage. The president announced three days earlier that he would meet with the victims of a tornado that killed 23 people and caused extensive property damage. "I'll be heading to Alabama on Friday," Trump said during a White House veterans' event. "It's been a tragic situation. But a lot of good work is being done." 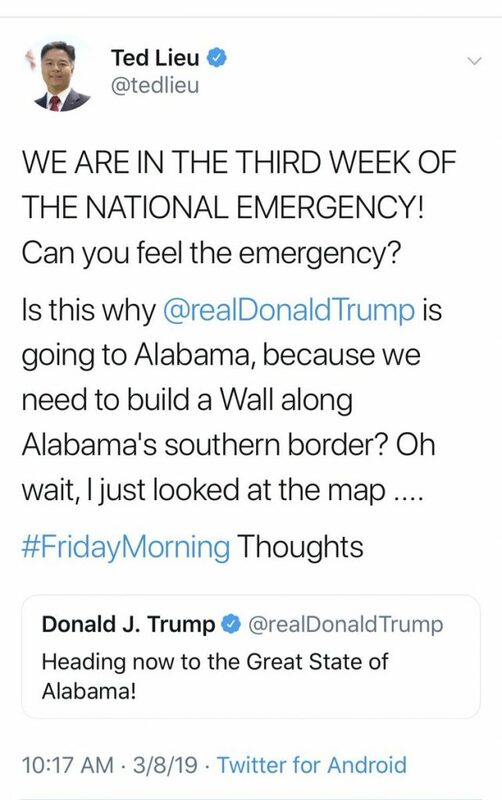 When the day came, Trump tweeted he was on his way to Alabama. Lieu reacted with his "#FridayMorning Thoughts." "WE ARE IN THE THIRD WEEK OF THE NATIONAL EMERGENCY! Can you feel the emergency?" Lieu tweeted, a reference to Trump's effort to declare a national emergency in order to bypass Congress and fund his proposed border wall. "Is this why @realDonaldTrump is going to Alabama, because we need to build a wall along Alabama’s southern border? Oh wait, I just looked at the map…" he continued. "#FridayMorning Thoughts." After criticism, Lieu deleted the tweet and apologized, admitting he didn't realize the purpose of Trump's visit. I have concluded based on Twitter comments I received that my last tweet was inappropriate. I understand the purpose now of the President's visit to Alabama. I apologize and am going to delete my tweet. 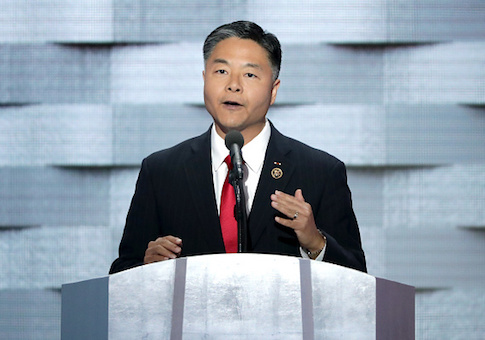 Lieu has something of a habit of sticking his foot in his mouth on social media, previously apologizing after he tweeted that an underage Parkland, Florida school shooting survivor should travel to California and sample their marijuana. Lieu also deleted a tweet after he was called out by White House press secretary Sarah Sanders for tweeting out a false and misleading headline. This entry was posted in Politics and tagged Donald Trump, Ted Lieu, Twitter. Bookmark the permalink.